Governor Andrew M. Cuomo today announced the launch of Coaches Care, a new initiative aimed at educating teens about safe driving by encouraging coaches to openly discuss the issue with student athletes. Albany, NY - October 15, 2015 - Governor Andrew M. Cuomo today announced the launch of Coaches Care, a new initiative aimed at educating teens about safe driving by encouraging coaches to openly discuss the issue with student athletes. The program’s kick-off coincides with National Teen Driver Safety Week, a nationwide effort to raise awareness about keeping young adults safe on the roads, which runs from October 18-24. Coaches Care is the result of a partnership between the Governor's Traffic Safety Committee (GTSC) and schools statewide. The campaign builds upon the Committee’s No Empty Chair campaign, launched in 2014, and the No Empty Chair Cops Care initiative introduced in April 2015, which provide police and school resource officers tools to help them educate teens about safe driving during prom and graduation season. As part of the campaign, informational posters will be displayed in locker rooms, classrooms, and high-traffic areas in schools. School administrators, athletic directors, and coaches should contact Todd Engwer of the GTSC to request the posters free of charge by emailing him. Talking points are provided on the GTSC website for coaches to help teens understand the dangers they face on the road. Information about the National Highway Traffic Safety Administration's “5 to Drive” list will be made available in these talking points. This list contains five necessary rules for addressing the greatest dangers for teen drivers: alcohol, texting, seat belts, speeding, and extra passengers. Additionally, coaches are encouraged in the talking points to remind young drivers about the Graduated Driver Licensing (GDL) law, designed to provide time for young people to gain critical experience in various traffic scenarios in a safe and controlled manner. The New York State Department of Health created GTSC-funded pocket guides for law enforcement agencies and others regarding the GDL in Upstate New York, New York City, and Long Island. 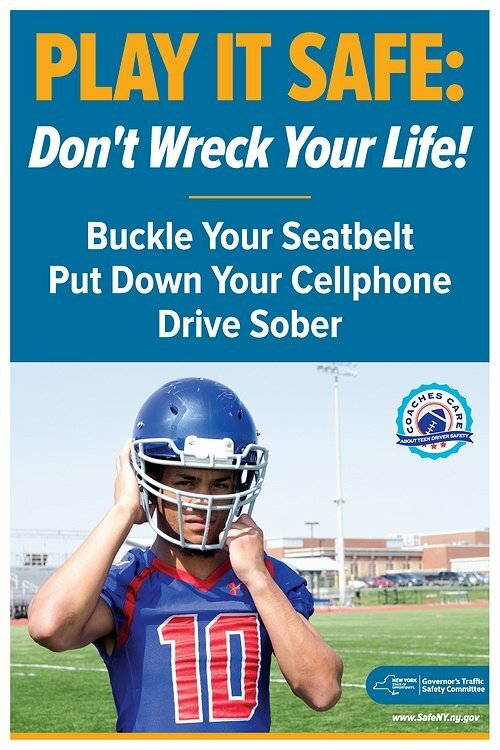 New York State Health Commissioner Dr. Howard Zucker said, “Certain adults have tremendous sway over teenaged drivers, and coaches are certainly among them, which is why this new initiative is so important. By using their influence, coaches may be able to instill better driving habits into New York's youngest drivers, saving lives in the process." According to the Centers for Disease Control and Prevention, motor vehicle crashes are the leading cause of death for U.S. teens, making it important for parents, teachers, coaches, and others who have an influence on youth to join in teaching youth about driving safety. A survey conducted by the Governors Highway Safety Association in February noted that 62 percent of state highway safety offices indicated coaches present one of the greatest opportunities to influence teens in their state. As many as 13 percent of motor vehicle fatalities occurred in crashes involving drivers ages 16 to 20. “Driver inattention/distraction” was the most frequently reported contributing factor for both drivers ages 16 to 20 and for all drivers in fatal and personal injury crashes. Drivers ages 16 to 20 in fatal and personal injury crashes were twice as likely as all drivers to have “unsafe speed” reported as a contributing factor. For additional resources educators, coaches, or school resource officers can request for teen driver safety events, click here. For DMV resources for younger drivers, click here. Subject: LongIsland.com - Your Name sent you Article details of "Governor Cuomo Launches 'Coaches Care' Campaign to Educate Teens About Safe Driving"